CITE AS: Daniel Bateman, "Post Excavation begins!," in 100 Minories, September 3, 2015, https://100minories.lparchaeology.com/post-excavation-begins/ [Date Accessed: April 23, 2019]. After finishing excavation work at back in July, the L – P : Archaeology team have been busy starting on the Post Excavation phase of the 100 Minories project. All finds and samples have been transported to the L – P : Archaeology East of England unit in Bishops Stortford to be processed. Bucket loads! Archaeological samples taken from the 100 Minories site for processing. The excavation produced a staggering amount of archaeological material from small and delicate items like rope, tobacco pipes, and egg shells, to larger artefacts, such as timbers and worked stone. 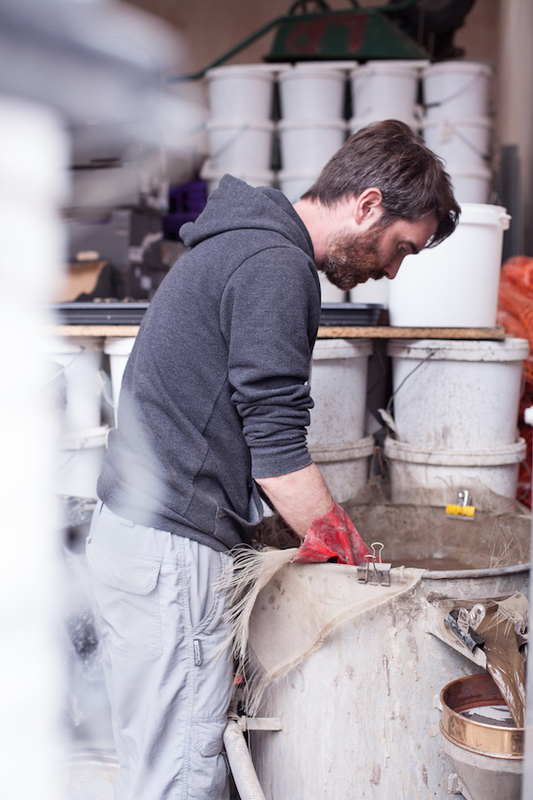 All finds are essential to our understanding of the site; the first step is to wash all finds and float the samples before they get re-packaged. 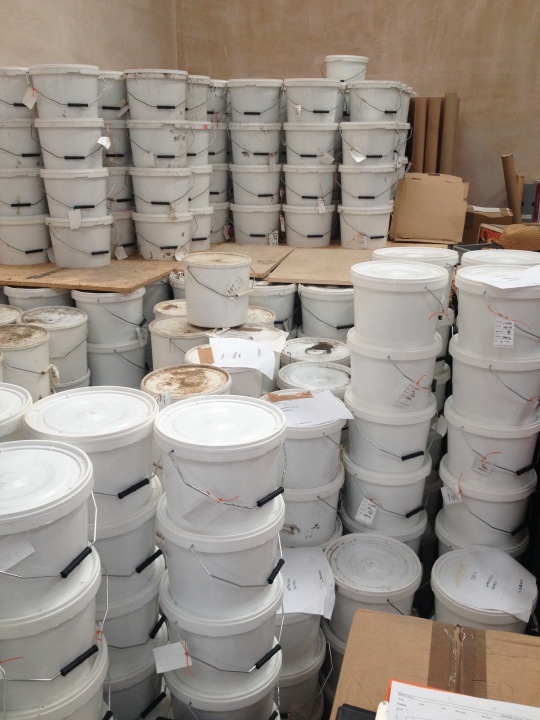 Then our finds are sent off to finds or environmental specialists, respectively. These specialists will then analyse the samples and finds and produce reports that will inform and feed into the final interpretation of the site. L – P’s enviro specialist, Matt Law, floating samples. The Post Medieval timbers, are being preserved on site at our East of England unit in a large, built for purpose water tank. This is to prevent the wood from rotting or decaying after we have taken it from the wet, anaerobic conditions on the site, that preserved it so well in the first place. As soon as possible we will be organising Dendrochronological analysis for these timbers to provide us with dates, before the timbers degrade too much. 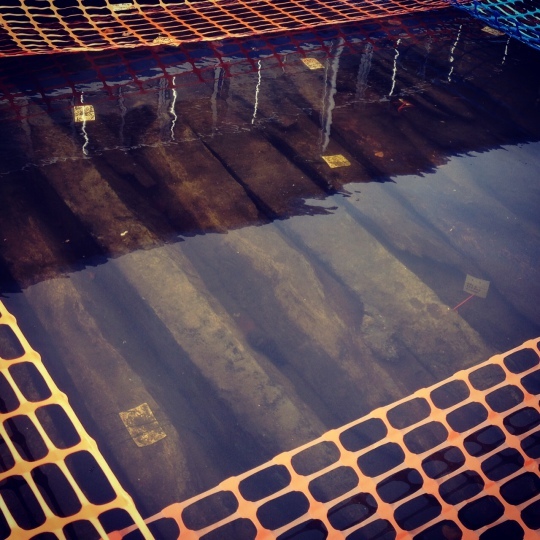 Revetment timbers preserved in timber tank. Although final publication of Minories is a long way off, our archaeological enquiry is in full swing. The digitising of our paper record has been underway since the team vacated the site in July 2015. Our context sheets are being digitised and cross-referenced into our ARK database, whilst the plans and sections are being digitised into a site GIS. This process has been greatly aided by our continued development of apps and plugins for the open source software QGIS, which is the GIS application in use at L – P : Archaeology. You might remember back in March, we published a series of articles relating to this work being advanced by team member John Layt, our surveyor and GIS officer for the project. The on-going development of these productivity apps has been and will be hugely impactful on the rate and ease at which the site archive can be digitised, with examples such as the georeferencing of permatrace plans reduced from 40 to just 3 clicks. At the same time our 100 Symposium projects are also entering a post-excavation development phase, maturing in the same way, as post-exc analysis continues and the dataset consolidated. Those projects already published on our Research Dashboard, will be joined by others such as the ‘Post-Medieval Archaeology and Theory at Minories’, the ‘East India Co. vignettes’, the Ogilby & Morgan mapping project, and the Pre-Bazalgette sewer mapping project, and more. 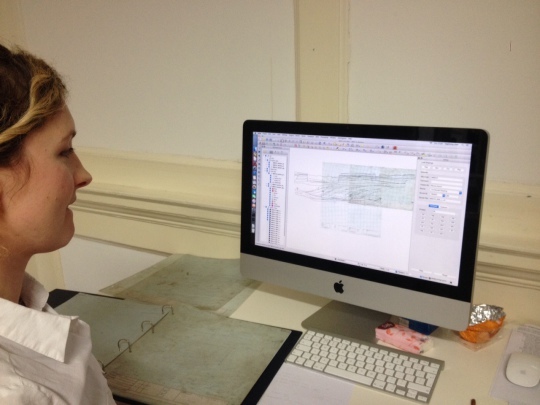 Manca Kavcic digitising plans of the City Ditch section. 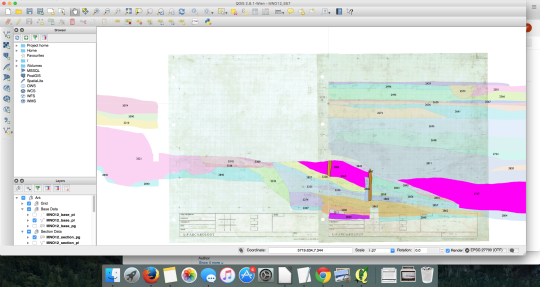 Digitised section of the City Ditch. At autumn goes on, expect renewed season of Symposium activity as these projects are developed, and published here on the 100 Minories website. Also catch the Minories crew at York Heritage Research Seminar Series, at the University of York and broadcast live online on the 24th November 2015: “On Time, on Budget” and Beyond: Challenging the Modus Operandi of Commercial Fieldwork.